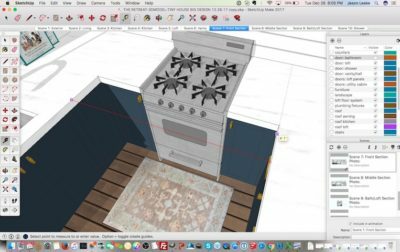 When my wife wrote about our tiny house on her popular food blog, 100 Days of Real Food, we were overwhelmed by the positive response. I’m happy to announce that we finally have the floor plan available for sale! 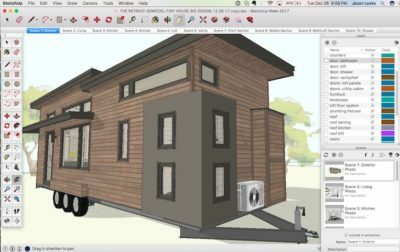 To come up with the design, we spent months watching tiny house TV shows and scouring the corners of the Internet for the best ideas. We then worked through about 15 design iterations in 3D before settling on the floor plan you see here. 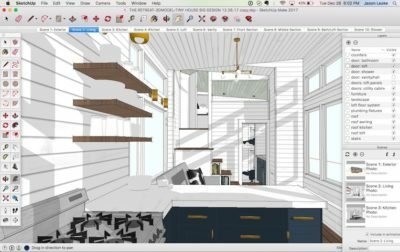 To get the standout result we were after, we hired a professional architect to finalize the exterior details (like window sizes and positions), a professional interior designer to help with selections (like paint colors and fixtures), and a professional builder, Blue Ridge Tiny Homes out of Asheville, NC, to bring the design to life. If you could see yourself in a tiny house like ours (or your own version of it), why not save yourself a ton of work and expense and start with our plan? 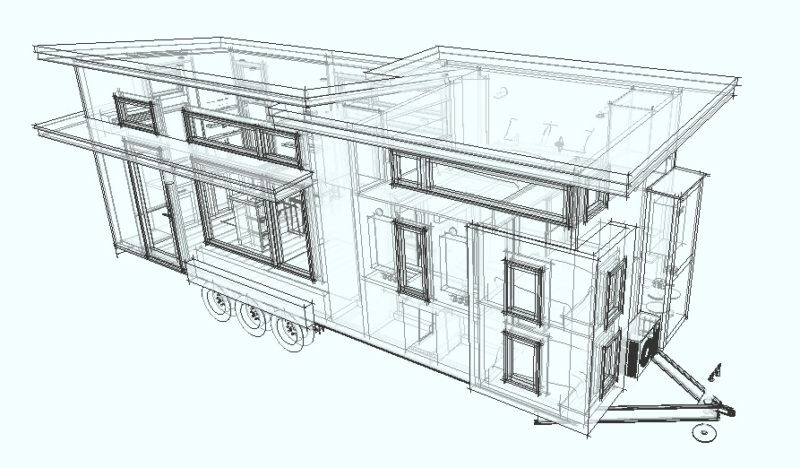 Note these are not construction drawings (with structural details and a material take off), but an experienced builder should be able to bring them to life for you along with any personalizations you desire. You (or your builder) can modify the model to experiment with design changes, furniture placement, etc. No warranties are expressed or implied. It is your responsibility to contract with a qualified building contractor to ensure your home meets structural, safety, and regulatory requirements for your application and location. 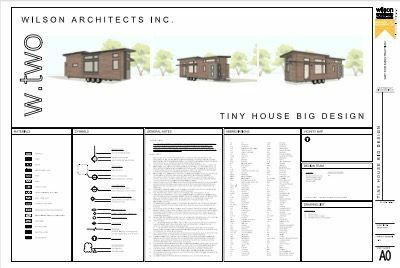 Designs are copyright protected and may not be reproduced or distributed other than to facilitate building one tiny home for personal use. Hi Sylvia – Our house is built on a 10×30′ trailer so is about 300 sq ft downstairs and about 105 more in the loft. Hi Jason, does the fact that you’re on a 10′ wide trailer mean you had to pull permits and/or have escorts when you moved it to it’s final location? Are you able to share information about your trailer, such as how tall the deck is from the ground (did you choose ‘deck over’ or deck between?’) and overall height of your home? Hey Krista – Check out the latest post for info on our move. The wheel wells are under the wall so mostly protrude outside of the house, but do come in about 3 inches or so inside (from memory). So the deck is as low as it can go, and the height of the house is just a little under the 13.5′ max for roadway travel. We wanted tall ceilings! In terms of floor height, I want to say it is about 28″, but I am not there to measure at the moment, and the house is on blocks now. You can see a tour of the home here (I’ll be updating it with more pictures over time), but I can’t make the floorplan available for display as that is what I’m selling. My husband and I are considering doing this. So many questions. Did you buy a piece of land in the mountains to set your Tiny House on? I see its on wheels, but also blocks. Do you leave it there permanently or do you take it back and forth? Also, your wife’s post said it had a regular toilet. How does that work with a house on wheels, where does the waste go? Hi Jill – Please check out the FAQ. I just updated it with the answer. This has got to be one of the most aesthetically beautiful and most function/comfortable laid out tiny house I’ve seen. You can tell a lot of time was spent reviewing and trying different layouts – great job! As a fellow designer I understand the effort and value you are providing with these plans. I know it’s hard to say and has a lot of variable factors but is there any way to put a final price to what a tiny house of this size would cost? Materials and equipment alone? Hi Krista – I’ve just updated the FAQ with this info. Please take a look. This looks absolutely beautiful. My wife and I are considering building a tiny house of similar design. We’re also considering purchasing your layout. But we like to get an estimate of how much this would cost to build. Any information would be much appreciated. Thanks! Hi Sanjai – Thanks! I’ve just added this info to the FAQ page. Please check it out.